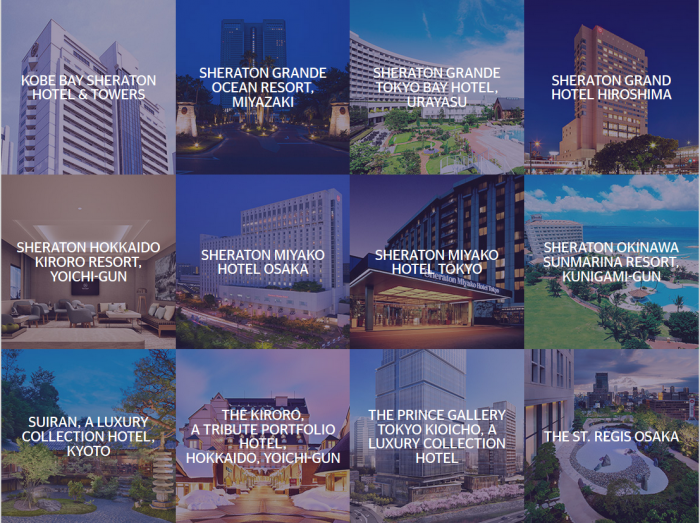 Starwood Preferred Guest (SPG) has launched new promotion for those members that have SPG affiliated Amex credit cards and will have some spending coming up before the end of the year in Japan. SPG members that have Amex card can earn 5,000 bonus Starpoints after spending 100,000 yen (roughly $1K) between October 19 – December 31, 2016. You can access and sign up for this offer on Starwood’s website here. 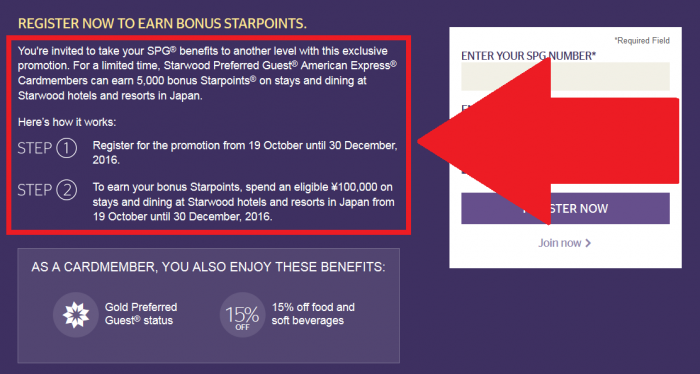 Nice small Starpoints bonus for those that stay or wine & dine at any of the properties in Japan during the promotional period. Registration & Eligibility: Only SPG® Members who are also Starwood Preferred Guest American Express Cardmembers and who received the invitation email from SPG are eligible to register for this campaign. Those who received an invitation email must register online at spgpromos.com/spgamex5k by 11:59 p.m. Japan Time on 30 December 2016. A registered member who, at the time of registration, is already an existing Starwood Preferred Guest American Express Cardmember (the “Cardmember”) can earn 5,000 bonus Starpoints® for spending JPY100,000 on eligible dining or an eligible stay from 19 October 2016 until 30 December 2016 (the “Promotion Period”) at any SPG-participating hotels and resorts in Japan. A registrant can earn only one time for a maximum 5,000 Starpoints with this campaign. Anyone who has not received this offer email directly from SPG and who is not a Starwood Preferred Guest American Express Cardmember at the time of registration and during the campaign period is not eligible for this campaign. This campaign is invitation only. 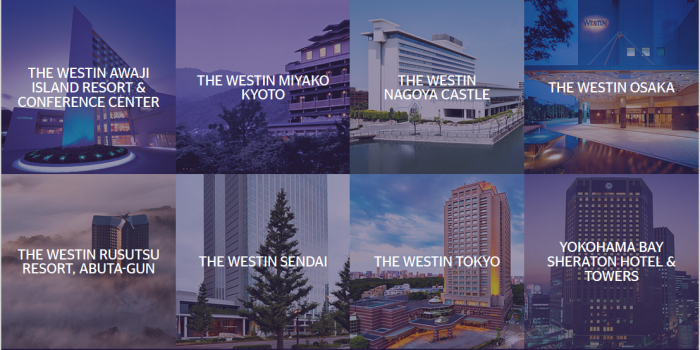 Earning: Qualified Starwood Preferred Guest American Express Cardmembers who are registered for the promotion will earn 5,000 Starpoints on accumulative JPY100,000 eligible spend from 19 October 2016 until 30 December 2016 at SPG-participating hotels and resorts in Japan. Participating SPG hotels and resorts in Japan can be found on the participating hotel list at spgpromos.com/spgamex5k. Offer is eligible with other Starpoints promotions; however, each offer will award bonus Starpoints independently of each other, and offers are not combinable. Bonusing: Bonus Starpoints will post to the registered Member’s account within 2–4 weeks after the Starpoints for qualifying eligible spend are posted. Qualified Cardmembership: This campaign requires registrants to have qualified Starwood Preferred Guest American Express Cardmembership before the promotion period begins on 19 October 2016. You can ring the Customer Contact Centre to confirm your Cardmembership start date. Eligible Spend: Eligible spend is defined as a spend paying an eligible rate for a stay and for dining, after which Starpoints post to the Member’s Starwood Preferred Guest® account. An eligible rate is any rate that is eligible to earn Starpoints in the Starwood Preferred Guest programme. A description of eligible rates can be found at spg.com under the programme terms and conditions, Section 2.1. Note that certain prepaid room reservations, such as when the booking is made through a third party — including but not limited to travelocity.com, expedia.com, orbitz.com and delta.com — and dining bookings through third-party channels are not considered as eligible rates and do not earn Starpoints or qualify for promotional earnings. Stays/dining must be booked through any Starpoints-eligible channel, which includes a travel professional who books through those channels or the GDS. Please note that spend as an SPG Pro and catering spend do not count toward the eligible spend for this campaign. All promotions are subject to the Starwood Preferred Guest programme terms and conditions, which are subject to change without notice and can be found at spg.com. Participating hotels and resorts may change without prior notice. Offer is applicable to individual Members only and not to groups/catering bookers nor SPG Pro members with SPG Pro bookings. Not responsible for omissions or typographical errors. Starwood reserves the right to discontinue this offer at any time. To update your communication preferences or learn about our privacy practices, view our Privacy Statement at spg.com/privacy, or access our privacy information line by ringing 1-877-782-0071 in the US and Canada or +353-21-4930474 in all other countries. Void where prohibited by law.